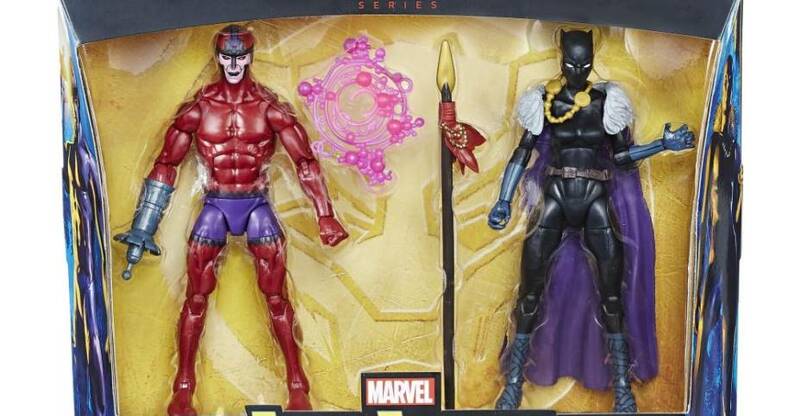 Pre-orders are now live for the Black Panther 2-Pack with Shuri and Klaw Marvel Legends 6″ Scale Figures. The Shuri figure includes a cape and spear. The Klaw figure includes an energy effects piece. The set is priced between $39.99 to $41.99 depending on where you order. 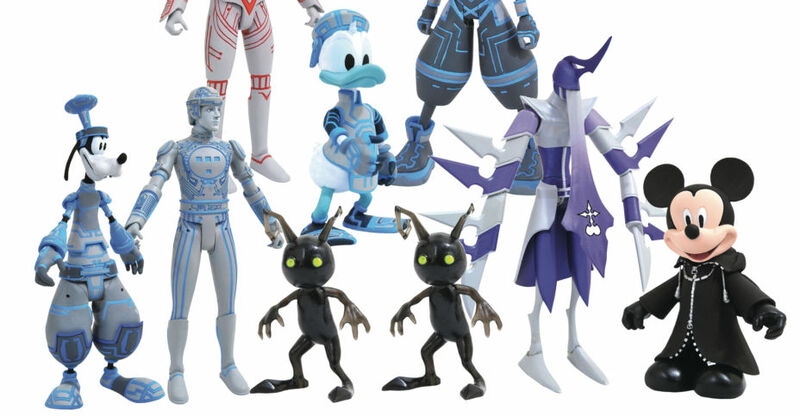 The set is a former Toys R Us Exclusive getting new life as a general retail release. The set is scheduled for release in March. See details and pre-order links below, and photos after the jump. These master innovators armed with their own expertly designed weapons, prepare for battle. 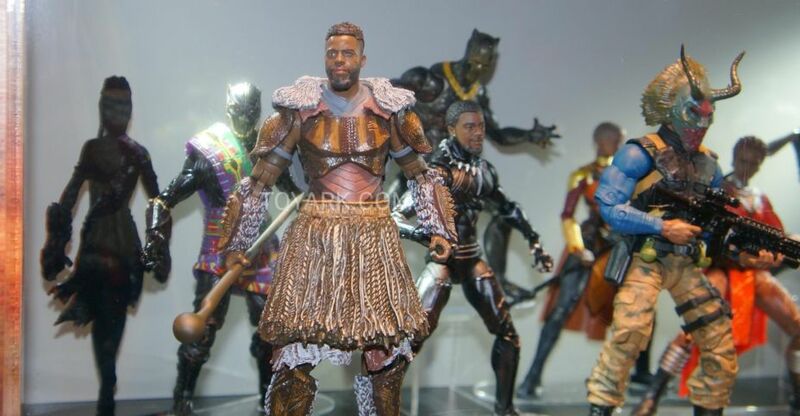 Imagine Shuri designed the latest in Vibranium technology and Klaw preparing himself for battle with this figure 2-pack, featuring 6-inch scale Shuri and Marvel’s Klaw figures from the Marvel Legends Series. With the Legends Series, kid and adult Marvel fans can start a legendary collection of comic- and movie-based Marvel characters (each sold separately). These 6-inch scale Shuri and Marvel’s Klaw figures are highly articulated and feature a comic-inspired design, making them another worthy addition to the Marvel Legends Series. Hot Toys has posted their official images and details for the upcoming Black Panther – Shuri 1/6 Scale Figure. 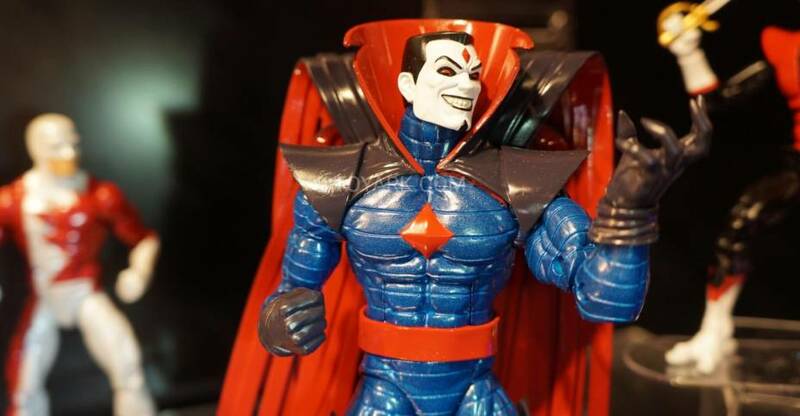 The figure will stand just under 11.5″ tall with about 28 points of articulation. Shuri includes interchangeable hands, Vibranium gauntlets, a staff, and a figure stand. She is scheduled for release between the third and fourth quarters of 2019. Check out the official details below, and see the new photos by clicking the headline of the story. Black Panther, one of the movies released by Marvel Studios earlier this year, keeps smashing records and exceeding the box-office and expectations. The Princess of Wakanda, Shuri, is the leader of the Wakandan Design Group responsible for developing this African Nation’s modern technology. When the young King T’Challa is drawn into conflict that puts his homeland Wakanda and the entire world at risk, Shuri has proven herself a great backup on creating new security system and weapons, including the Panther Habits and her cool looking panther-like gauntlets. Received a tremendous amount of attention in the already-happened exhibitions in San Diego and Hong Kong recently, Hot Toys is more than excited to introduce fans today the long awaited 1/6th scale collectible figure featuring T’Challa’s innovative little sister – Shuri of Black Panther. 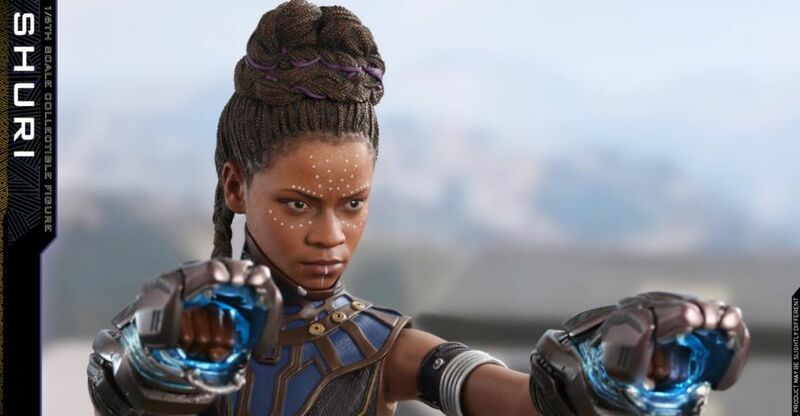 Beautifully crafted based on the appearance of Letitia Wright as Shuri in the movie, the highly-accurate collectible figure features a newly developed head sculpt with detailed hair sculpture, a newly developed body, an adorned elaborate new battle suit and neck ring, a Wakandan pattern sash, a wide range of weapons and accessories including a pair of LED light up Vibranium Guantlets, a spear, a Kimoyo Beads bracelet and a movie themed figure stand! Gear up now to defend Wakanda with Shuri and her eye-catching weapon! Hasbro dropped in a few new figures int othe Marvel Legends display at San Diego Comic-Con 2018. these include the highly anticipated M’Baku as well as a an Erik Killmonger and a Deadpool with Dogpool on a scooter. Check them out by clicking the headline of the story. 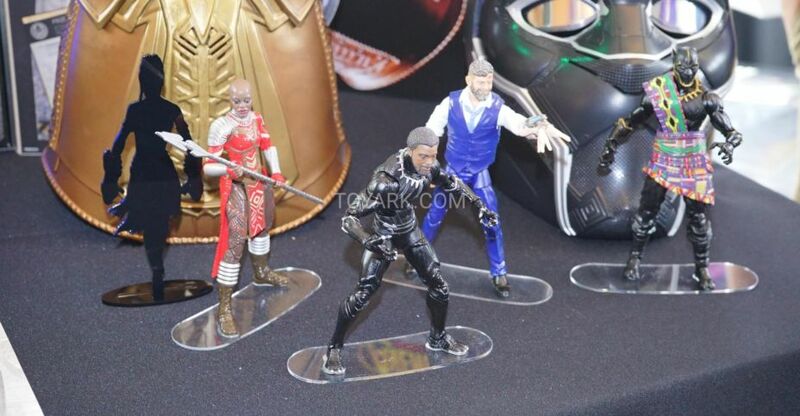 New Black Panther Marvel Legends 6″ Figures highlight the Hasbro Breakfast Marvel reveals. There are also new Marvel Vintage Legends as well. A few new Marvel Cinematic Universe statues are coming from Diamond Select Toys. 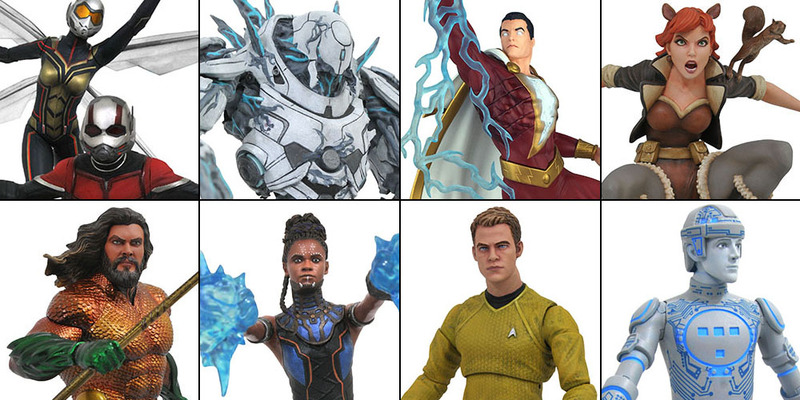 In a new article by EW.com, we have a first look at four upcoming statues. 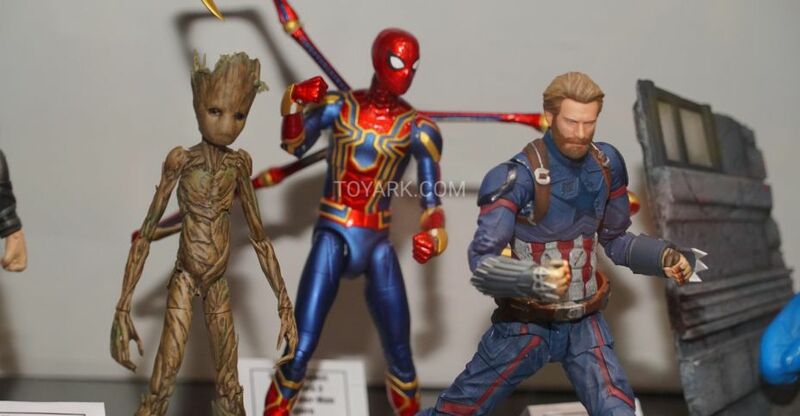 The releases are part of DST’s Marvel Gallery PVC Diorama Statues. 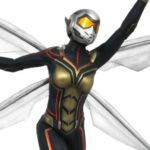 Included are an Ant-Man and The Wasp. These are sold separately, but are designed to be displayed together. There’s also a Shuri statue as well as a new Black Panther statue. These statues measure roughly 9″ tall, depending on base and pose. They are priced at $45 each. They are set for release some time this Fall. Check out the images after the jump.